I was searching for a tool to support my own reading of the Bible and was unable to find one that met my needs. So I built one, which is now available here. I hope that it will be similarly useful for you. It started with two frustrations. Firstly, finding the gospel parallels and other related verses when reading the Bible is laborious. The information about what these parallels are is easily available, but stopping your reading to look it up and then look up the original is time-consuming. Secondly, navigating through ebook versions of the Bible is more difficult than one would suppose. Readers are often unsure of the chapter or even the book they are in. These problems cannot be solved perfectly, but the Cross-Referenced Bible project aims to be a compromise solution that balances the competing interests of undistracted reading with additional information at your fingertips. Hopefully, you will be able to dive in and have it do what you expect it to do. But let me spell out the features that I believe help with the two frustrations. I will describe the cross-referencing in more detail, how to contribute, and finally the navigation. 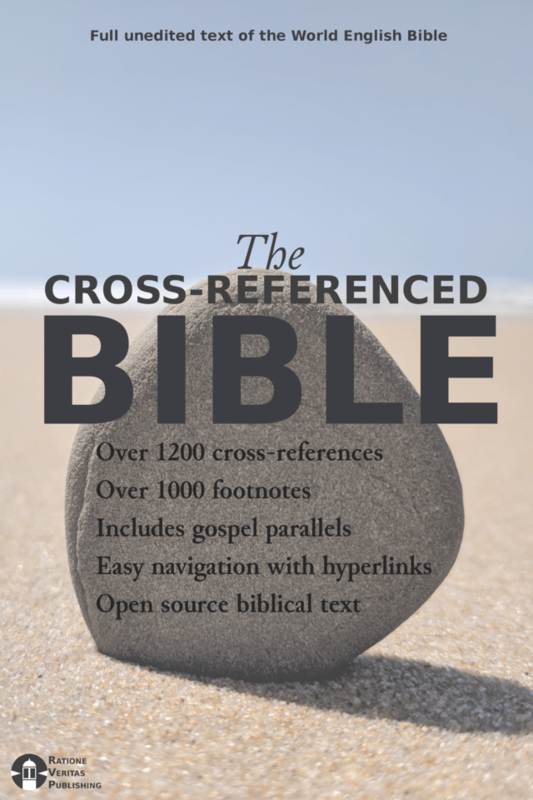 I have included over 1,200 cross-references including the original references found in the World English Bible. These come from a number of sources, and I expect it to grow in future editions. The Kings of Israel and Judah. Firstly, I have reverse-referenced the original World English Bible references. 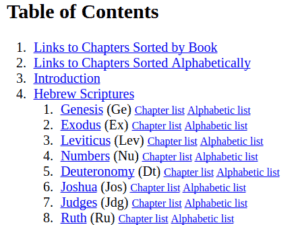 Almost all of the World English Bible references link New Testament scripture verses back to the Hebrew scriptures they quote, but do not refer the Hebrew scriptures forward to the New Testament. This version includes these additional reverse-references. This is useful in two different ways. It aids navigation (practically, you can click back to the verse you were reading) and it helps see how a given verse is used by different authors in the New Testament. Here you will see the reverse-references that I have added, and will note that it refers back not only to Mark 12:36 (and the parallels in Matthew and Luke) but also to Acts 2:35, and Hebrews 1:13. A simple click will take you to those verses and allow you to contrast how they are used and compare the contexts. So this first set of cross-referencing allows the reader to go from the Hebrew scriptures back to the New Testament scriptures that refer back to them. Secondly, I have added the gospel parallels directly as cross-references. I have loosely based this on the verses found at www.bible-researcher.com/parallels, which in turn are based on Kurt Aland’s Synopsis of the four gospels. I aim to have captured all of it and have added a number of other cross-references too. My tendency is to err on the side of inclusion. So for example, I link the two Lazarus stories (Lk 16:19-31 and Jn 11:1-46) even though the former is a parable and the latter is not. The similarity of the initial and final verses, the name of the main character, and the broad theme is enough to link them for this purpose, even though Kurt Aland does not do so. I also link the genealogies back to the Hebrew Scriptures, rather than just linking the Luke and Matthew versions as Aland does. Jonathan Petersen created a chart linking the various Kings of Judah and Israel which can be found on www.biblegateway.com. This chart gives broad ranges, but based on this I linked the various Kings at the beginning of the stories about them. I originally was going to use GitHub for this, but have since changed my mind. Please reach out to me through the usual channels if you find any errors or want to suggest any additions. The Cross References and Footnotes can be viewed on this Google Spreadsheet. Just the books of the Bible in canonical order. 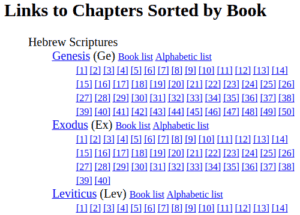 The chapters of the Bible in canonical order. 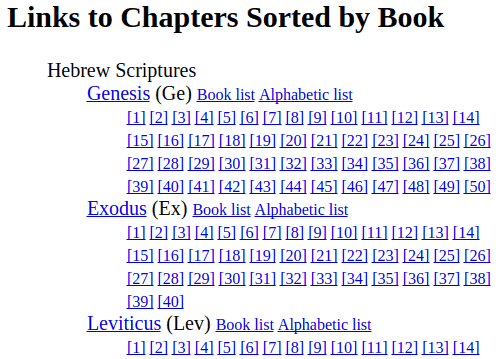 The chapters of the Bible in alphabetical order. The second of these forms a hub for navigation. 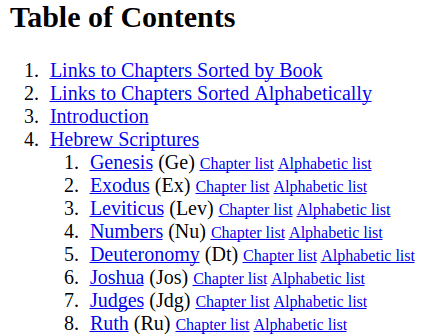 Every book title and every chapter number throughout the Bible is a link back to this second navigation page. 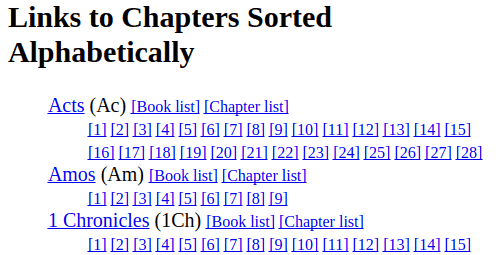 Another feature is that there are navigation links at the top of every book. 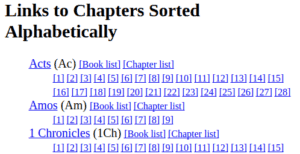 These links will take you to the previous book, the next book, and the alphabetically arranged third navigation page. The link will take you to the second navigation page. I must also offer thanks to the folks who made the World English Bible, a public domain, modern English version of the King James. Without a good and open source of the Bible, this project would be nearly impossible. I have a small rant about this in the introduction to my other book Evidence Considered. I have not changed any of the words of the Bible from the WEB. I sincerely hope that this will be a tool that allows you to delve deeper and read more effectively as you study the Bible. I have a few beta readers testing out the Kindle version. If you are interested to do that too, please let me know.